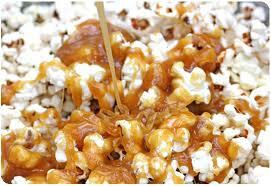 Sisters with Stuff: How about a batch of Homemade Caramel Popcorn for Superbowl Sunday! How about a batch of Homemade Caramel Popcorn for Superbowl Sunday! Popcorn is always a good snack to eat when you are watching a game, how about a delicious batch of warm homemade caramel popcorn, and it will make your house smell yummy too! Super easy I promise and very inexpensive to make. If you don't watch football don't feel bad, I could care less about football, I just go to the parties because of the food. Pop the popcorn put it in a large bowl and set aside. Bring the sugars, condensed milk and butter to a boil in a saucepan, let it boil for 1 minute. Remove and pour over popcorn with one hand while mixing with the other hand (be careful it's hot) continue mixing until everything is coated. Spread on a greased cookie sheet and allow to set.